On September 17th, over 500 people attended the Greater Chicago Pagan Pride day gathering at Pleasant Home in Oak Park, IL. According to the facebook group, over 1118 pounds of food were donated during the day and gratefully collected by the Greater Food Depository. 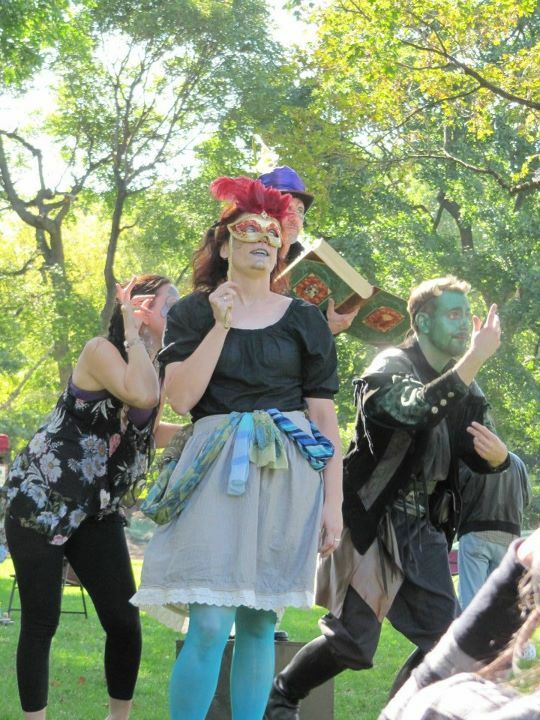 A shout-out to Terra Mysterium’s Amy Christensen for making the arrangements with the Greater Food Depository. If you weren’t able to attend the event, please make a donation here "donate." Gregory Brewer and his team should be praised for their work in creating a memorable day, and offering our community a chance to connect, learn, listen, and find joy together. 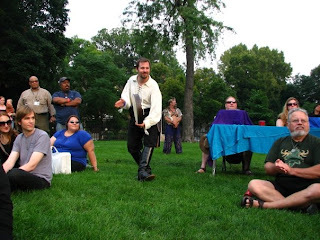 Pagan Pride owes its name, and beginnings, to Gay Pride events. Like Gay Pride, it is a time to embrace a public identity as a Pagan, to educate the general public about our various faiths/traditions/beliefs, and to gather in camaraderie. 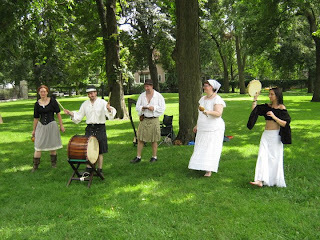 Unlike Gay Pride, Pagan Pride goes a step further by adding a charity component to the event. 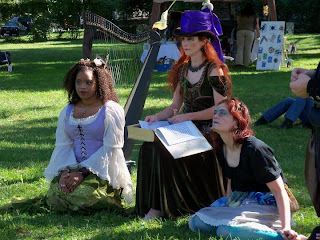 Statement of Purpose: The Pagan Pride Project is a non-profit organization. The primary purposes of this corporation shall be the advancement of religion and elimination of prejudice and discrimination based on religious beliefs. Mission Statement: The mission of the Pagan Pride Project is to foster pride in Pagan identity through education, activism, charity and community. We're never going to be able to practice our spiritual paths openly if we don't give the public accurate information about what we do and do not do. People aren't necessarily going to go out of their way to find out what Pagans really do. We have to have the courage to act on our convictions and do what we need to do. 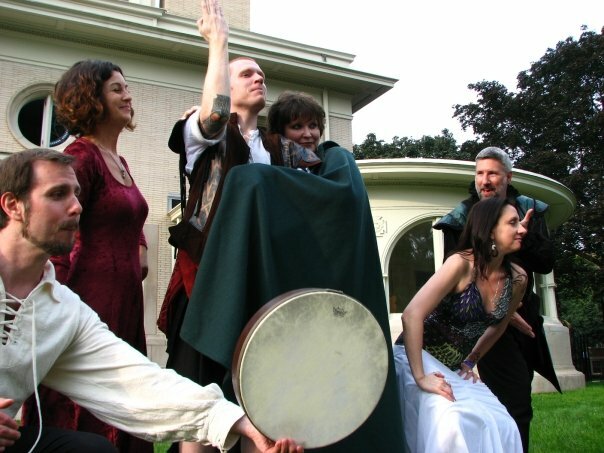 We're never going to be able to practice openly if we don't know anyone else in our local Pagan communities. We need to weave networking webs in our cities, in our towns, in our rural areas. We need these webs to support one another. That support will also show those who would restrict our practice that we are not just a few isolated wackos, but are a growing congregation of people who adhere to a faith that, while different, is as valid as their own. The language used above perfectly demonstrates the activist/earthy roots of contemporary Paganism. The end result is that it can all feel very isolating, especially if you are a Pagan living in a small town ("The Small Town Pagan's Survival Guide: How to Thrive in Any Community by Bronwyn Forbes). Connecting in a community that honors diversity, pluralism, and the presence of the sacred in nature is a very powerful remedy. However, we have a lot of work to do. Let us be even better informed, better organized, and speak out for our liberties. This is why Pagan Pride is so important. We must not hide from the world, and we must help each other. Let us also ally ourselves with other minority faiths to work together for our right to practice our religions in peace, freely, as the founding fathers intended. Let us embrace pluralism and the acceptance of different religions, worldviews, and philosophies. We must also fight against any groups who seek to limit pluralism and the freedom to practice religion. Take, for instance, this group. Click on “51 Days of Reformation Intercession” to see the prayer schedule and intent. Beginning on October 3rd and ending November 22nd, a group of neo-Pentacostal Christians will be exorcising the United States of America of “Pagan influence” one state at a time in the reverse order of the adoption of Statehood. They will culminate in Washington District of Columbia on 11/11/11 to overthrow the “Goddess”of Columbia (Liberty), and institute the title: Washington District of Christ. Their goal is to establish Christian law as supreme in a land that is pluralistic by law, and the intent of the founding fathers. For more on Dominionism, click here. It can be very easy to dismiss these folks as extremist crackpots, but I point you to the powerful book “Contemporary Paganism: Minority Religions in a Majoritarian America” by Carol Barner-Barry which effectively demonstrates what minority religions suffer legally due to the prejudices, and arrogance of majoritarian American religious beliefs. The text shows how badly our rights to freely practice our religions are being eroded away without our awareness. Have your non Pagan friends read it too, so that they can also engage the world around them in a more just manner. In response to the above, I firmly believe that we need to stop publicly debating differences in theology and embrace pluralism. We need to spend less time explaining our core beliefs, and more time demonstrating that we are concerned citizens and taxpaying workers who are invested in our communities and the work at hand. As an antidote to the uninformed “sound-bites” of tea-party rhetoric, I recommend that everyone read Barbara A. McGraw’s excellent text “Rediscovering America’s Sacred Ground: Public Religion and Pursuit of the Good in a Pluralistic America.” This book is an enlightened balm for the soul filled with sound history, and the philosophy of the founding fathers, and the time in which they lived and created our country’s governing documents. Last, we need to continue to create and support art, music, theatre, film, literature, dance, and culture that will embody the ideals we wish to inform the world. We are the land, and we are the World. We do not have dominion over any living being because everything in nature is our kin. Let us work everyday to be better stewards of the Earth, children of Gaia, and the embodiment of the Divine. Wonderful explanation of the importance of Pagan Pride. Hopefully, many will read this and enlighten others. Congratulations on collecting 1118 pounds of food for the Great Food Depository!